Construction on Quay Tower is wrapping up as the 30-story residential building nears completion. 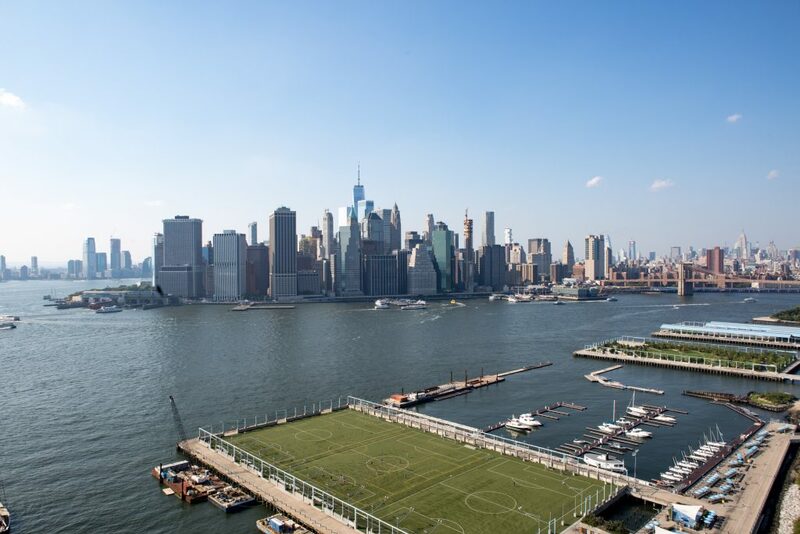 Located across from Pier 6 along the Brooklyn Heights waterfront, it sits next to the southern tip of Brooklyn Bridge Park. 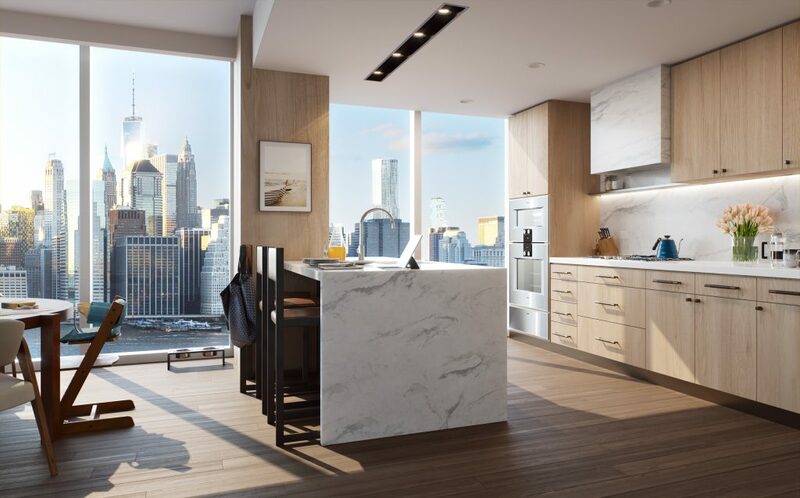 Designed by ODA Architecture and developed by RAL Companies and Oliver’s Realty Group, the 315-foot tall skyscraper will bring 126 units to market with the help of Douglas Elliman Development Marketing. The facade is made of glass and brushed copper-hued metals that frame each panel on all four sides. Mechanical units and equipment at the top of the skyscraper have yet to be enclosed in a dark-colored envelope, but will soon blend in with the overall appearance of the 274,500 square foot project. In the next several weeks, the exterior construction elevator on the western elevation should come down. Prices for the units range from $1.9 million dollars to $5 million dollars, with each residence averaging 2,180 square feet. Last year, the $20 million dollar penthouse set a record as Brooklyn’s most expensive sale. 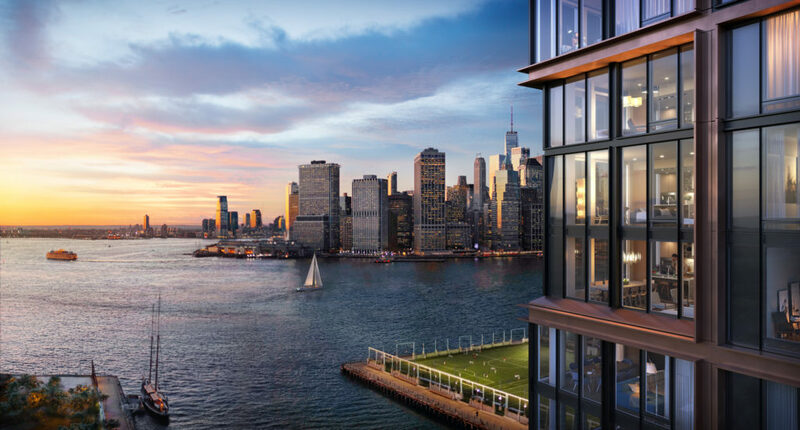 The penthouse will include 7,433 square feet of indoor space, as well as 1,180 square feet of outdoor terrace space overlooking the Lower Manhattan skyline and the East River. Views of the Brooklyn Bridge and the adjoining park will also add to the scenery. Units facing west towards Manhattan will get their own high-speed elevators and a separate foyer. Amenities for Quay Tower include 24-hour concierge service, a double-height lobby, private and bicycle storage, a 2,500 square foot fitness center, a pet washing spa, conference rooms, a music practice room, and a package room with cold storage. There will also be two rooftop lounges. The Rooftop Sky Cabana Entertainment Lounge will come with harbor views, outdoor sun and dining terraces with barbecue stations, and a flat screen entertainment center. The second space, called the Rooftop Sunset Entertainment Lounge, is set to feature views of Manhattan with indoor and outdoor fireplaces, barbecue stations, and a catering kitchen. Completion of Quay Tower is expected by July. 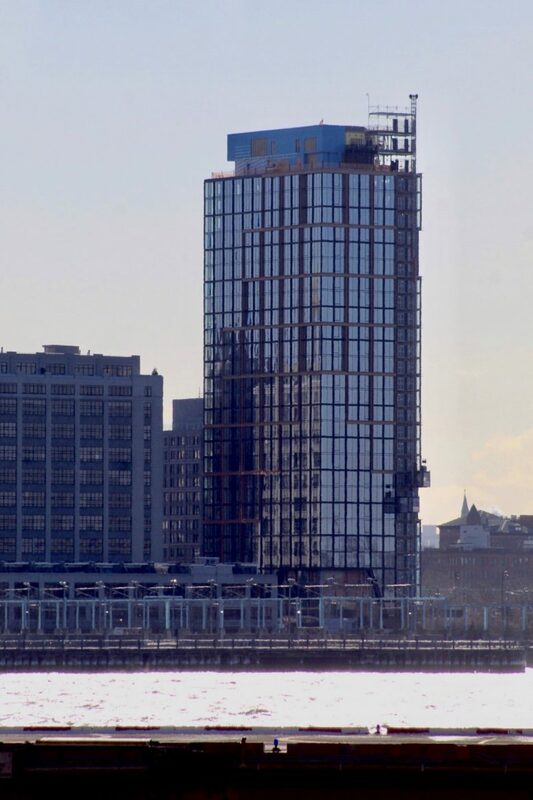 2 Comments on "Quay Tower Nears Finish Line Along Brooklyn Heights Waterfront"
ODA your work is a breath of fresh air – I love it. Would love to work with you on your next job.